Play equipment at a park in Earley was deliberately set on fire on Monday night. Officers were called to Sol Joel Park at 2245 BST after residents saw the fire. 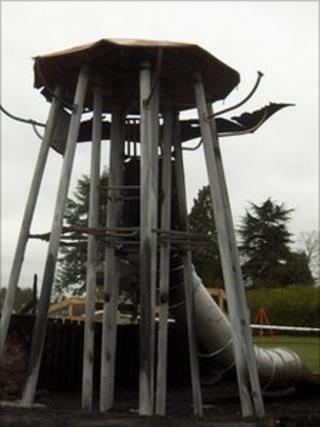 The cost of the damage to the Berkshire playground has been estimated at £40,000, including a "volcano" playground metal slide which was badly damaged. The playground was completely renovated in 2010. Philip Truppin, the clerk at Earley Town Council, said the play equipment which had been targeted looked like a "charred wreck". "I'm completely upset by it all," he said. "The playground is next to a school. When the parents were taking their children to school this morning, some of the children were in tears." Mr Truppin said he was waiting to hear from insurers to find out if they could afford to repair or replace the equipment.